You are currently browsing the monthly archive for March 2012. I am so excited to be attending my first Food themed getaway aptly named “Eat Write Retreat” to be held in Washington DC, in early May, 2012. I am looking forward to meeting other bloggers and peeps involved in the food and photography field. Lots of fun thing are in store for us even before we set foot at the retreat. Several sponsors have already challenged the attendees and those interested in attending to create and submit recipes and photographs. Apparently there is going to be a battle amongst participants split into teams, to work with a ‘secret ingredient’ a la Iron Chef. Strategizing and planning to create a dish out of the secret ingredient should begin soon, even before the conference is underway so we can plan ahead to execute it in front of a Judges Panel at the retreat. What a fun concept! Please check out the website for details and hope some of you reading this will come to DC to attend. 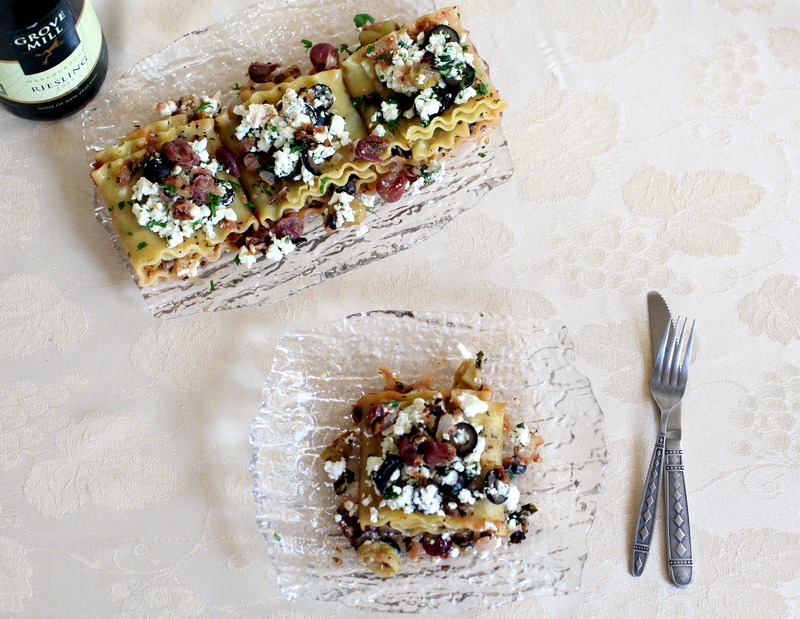 I developed this recipe as part of a sponsor’s challenge, which was to create a main dish using Lindsay Olives. When I begin to develop a recipe I think of creating a dish with simple, easily identifiable ingredients, so the dish is relatable to the consumer. This way they are more likely to make it. 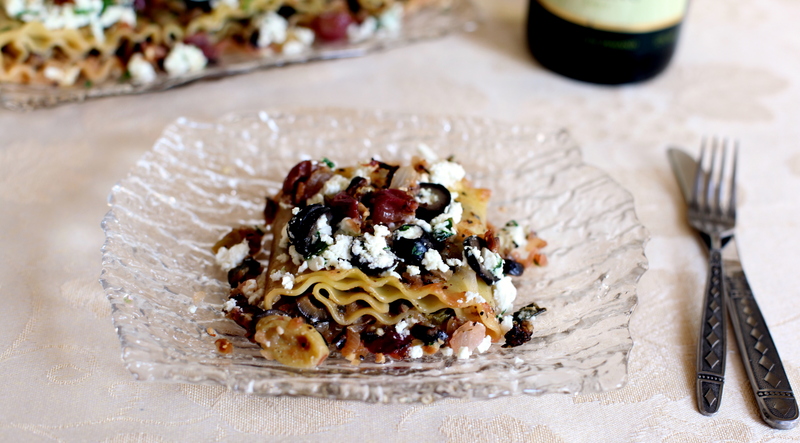 Olives, the theme ingredient for this challenge, immediately brought to mind these cast of characters; wine, cheese, pasta, olive oil, grapes, you get the drift. So I put those very same ingredients together to create this Mediterranean salad lasagna rolls. Another caveat to developing a good usable recipe is to keep the cooking process simple and not too intimidating. Hopefully I have achieved both and the fun part, my family was in pasta heaven two days in a row while I was testing out the recipe. 3 tablespoons olive oil divided, plus some extra for boiling the noodles to keep it from sticking together. 1 cup good drinking quality white wine, dry or sweet per your preference. I used a 2009 Riesling. Add a little oil to a large pot of salted water. Boil the lasagna noodles per package directions. 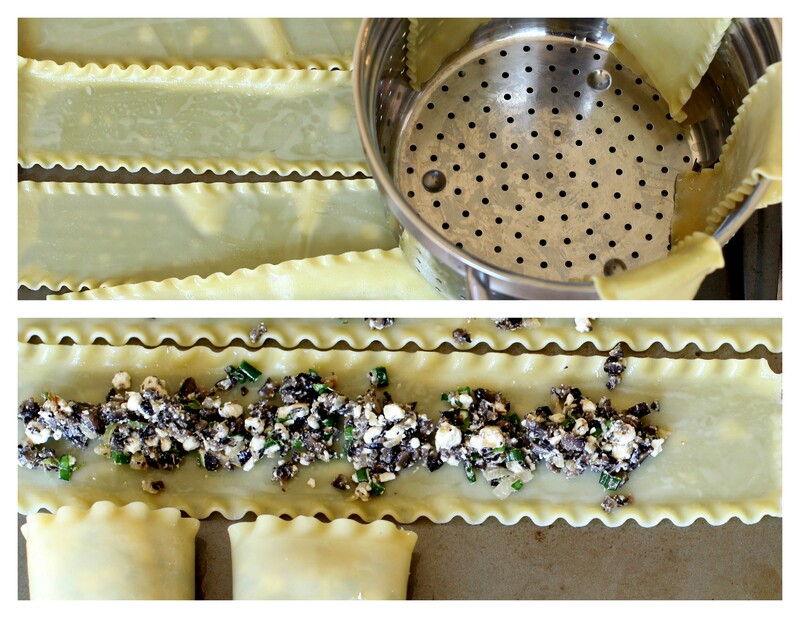 While the noodles are getting ready, make the olive salad filling. Drain both cans of olives separately. Tap several times to drain all the liquid. When the olives are drained, set aside one half of the sliced olives for garnish for later and chop the rest, making sure not to mince them too fine. 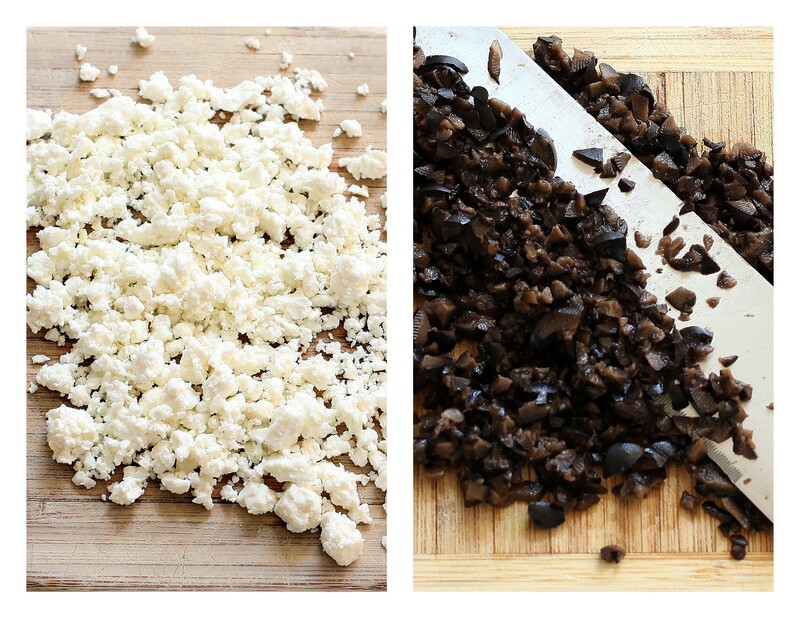 Use four ounces of feta, setting aside 1 ounce of crumbled feta for later to be used in the garnish. Chop the green part of the spring onions using everything except the portion from one spring onion to be used later for the garnish. In a bowl put a tablespoon of olive oil, the chopped olives, the feta, spring onions, oregano and pepper. Mix well to incorporate the flavors. Add salt if necessary though the feta is quite salty. Set aside. In a bowl put a tablespoon of olive oil, the sliced olives, feta and the spring onions that was set aside. Add the parsley, combine and set aside. Drain the lasagna noodles [don’t rinse in water] and spread on a lightly oiled flat surface or drape over your pasta pot. Working quickly on each noodle put about three tablespoons of olive salad filling and spread, leaving about one inch of the noodle without any filing. Roll the noodle from the end with the filling, like a jelly roll and when you come to the end, press the roll on the end of the noodle. This will help seal it. Next cook the onions in the butter and remaining oil in a stainless steel pan or a Dutch oven with a tight fitting lid, set over low-medium heat. Add the garlic and thyme, salt to taste and cook for a couple of minutes till the onions get translucent. Add the lasagna rolls seam side down and close with the lid. Wait for two minutes, remove the lid and flip the rolls. The rolls would have sealed nicely. Now add the grapes and wine, press the rolls gently to get maximum contact with the pan and put the lid back on. Turn the heat to medium and cook for about 5 -7 minutes till the alcohol has evaporated and you have glazed and candied onions sticking to the bottom. YUM! Remove lid and top each roll with the feta, olive garnish and spoon a little bit of the glaze over the garnish, remove the garlic if you wish and put the lid back on and turn the stove of. Let it rest for at least 5-10 minutes before serving. Enjoy! Copyright © 2011-2012 Sandhya Babu. All rights reserved.